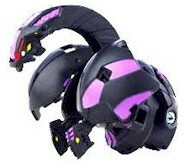 Hades is a Mechanical Dragon Bakugan who lives to serve the Vexos. He is Shadow's primary brawler when battling the Resistance. Hades has three fire breathing heads and six wings making him one of the fastest flying Bakugans. His three tails each have a spiky tip, so Hades can attack his opponent from many different directions. His metal exoskeleton can sustain multiple blows from any brawler, but on top of that he has three large metal thorns that further protect his heart from attack. Purchase Hades from Amazon now!